Recent molecular studies have shown that Xerocomus in its current circumscription is likely an artificial grouping and it is possible that it will be split at some point into smaller genera. Molecular studies also have changed our understanding about the species of xerocomoid boletes showing that morphological features are quite variable in this group. Not only microscopic study is essential for determination, but scanning electron microscope will be often needed in this “genus” as the spore ornamentation is not always seen under ordinary light microscope. Do bear in mind that macroscopic characters, such as colours, cracking cuticle, etc., tend to intergrade between the different species. 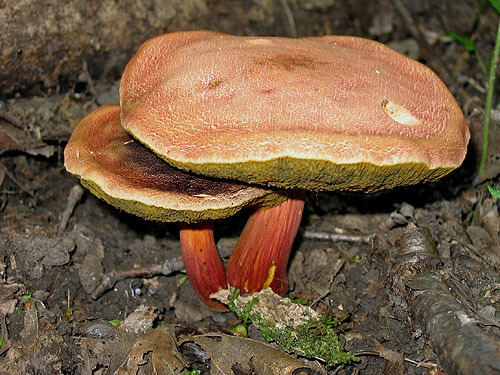 Note that Boletus impolitus and Boletus depilatus that were shown to be close to Xerocomus subtomentosus and its allies, are here retained in Boletus for practical reasons. The same applies also for Phylloporus pelletieri, placed here in a genus of its own, but being also close to Xerocomus subtomentosus group. Although large reference list will be found under most of the species, one should always consult Ladurner & Simonini (2003) having in mind that there are some new species (X. chrysonemus, X. marekii, X. silwoodensis) described after this otherwise superior book was printed. Useful keys, covering most of the European xerocomoid boletes (except some southern taxa) are provided by Knudsen & Vesterholt (2008), Hills (2008) and Kibby (2011), the later also featuring an excellent comparison chart. Fruitbody medium to small sized, boletoid, without veil and ring. Stipe solid, often tapering towards the base. Flesh variously coloured, changing or not when exposed to air. Tubes not separable from each other, instead tearing apart. Pores usually angular. Cap up to 8 cm, at first hemispherical then convex to flattened, apricot, peach to red or carmine coloured, exceptionally yellowish orange or yellow, discolouring with age to ochraceous with somewhat orange pink tint, dry, velvety and sometimes cracking. Stipe cylindrical or spindle-shaped, often curved at the base, pale yellow to yellow, at the lower half gradually becoming orange to reddish orange or red, stipe surface blueing. 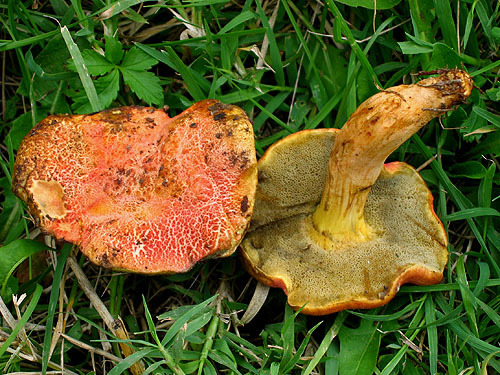 Flesh whitish to yellowish in the cap, yellowis in the stipe, orange yellow to apricot in the stipe base (this colour is fading after drying), blueing mostly in the cap when exposed to air. Tubes lemon yellow, blueing when injured. Pores concolorous with the tubes, blueing when bruised. Smell not distinctive. Taste not distinctive. Spores 11–17 × 4–6 μm, smooth. Pileipellis (the cap cuticle) a palisadoderm of septate hyphae. Hyphae composed of cylindrical cells. Habitat. Warm broadleaf woodlands, mycorrhizal with oaks (Quercus). Distribution. Recorded in many European countries, but apparently a southern species, that is absent in north. Similarity. Similar and might be confused with Xerocomus persicolor. 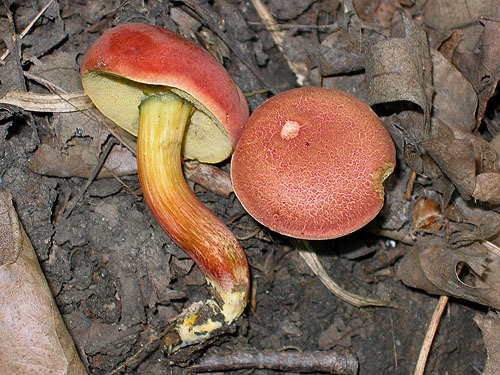 The flesh in the stipe base is similarly coloured in both species when fresh, this colour after drying is persistent only in X. persicolor and is fading in X. armeniacus. The cap cuticle of X. armeniacus is composed of hyphae with abundant plaques revealed when stained in Congo red. Such plaques are not seen in Xerocomus persicolor. 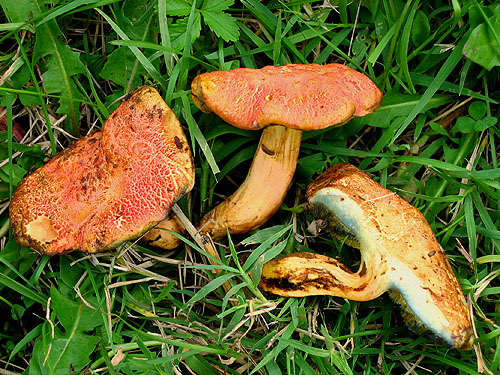 Some more reddish or discoloured fruitbodies of X. armeniacus might be similar also to Xerocomus rubellus; the later however has yellowish flesh in the stipe with characteristic red dots in the stipe base, that are not seen in X. armeniacus. Alessio, C.L. 1985. Boletus Dill. ex L. (sensu lato). – In: Fungi Europaei. Vol. 2. Pp. 1–705. Libreria editrice Biella Giovanna, Saronno. Hills, A.E. 2008. The genus Xerocomus. A personal view, with a key to the British species. Field Mycology 9(3): 77–96. Ladurner, H. & Simonini, G. 2003. Xerocomus s.l. – In: Fungi Europaei. Vol. 8. Pp. 1–527. Edizioni Candusso, Alassio. Watling, R. & Hills, A.E. 2005. Boletes and their allies (revised and enlarged edition). – In: Henderson, D.M., Orton, P.D. & Watling, R. [eds]. British Fungus Flora. Agarics and boleti. Vol. 1. Royal Botanic Garden, Edinburgh.